1955. Address: (Julius) c/o ICM, 8899 Beverly Blvd., Los Angeles, California 90048, U.S.A. Died: Philip died 9 February 1952. With Howard Koch, Casablanca (script), in The Best Film Plays of 1943–44 , edited by John Gassner and Dudley Nichols, New York, 1945. Films in Review (New York), November 1984. Film en Televisie (Brussels), no. 392, January 1990. Focus on Film (London), Spring 1973. Kilbourne, Don, in American Screenwriters , edited by Robert E. Morsberger, Stephen O. Lesser, and Randall Clark, Detroit, Michigan, 1984. Zolotow, Maurice, "Don't Call Me Mr. Casablanca," in Los Angeles Magazine , vol. 33, September 1988. Written By. . . Journal: The Writers Guild of America, West (Los Angeles), March and August 1997. If Casablanca represents the ultimate in the Hollywood studio film, then it is no surprise that the Epstein brothers rank among the best screenwriters to emerge from the Hollywood studio system. Their combined talents span almost 50 years of filmmaking, resulting in an impressive list of well-wrought screenplays. 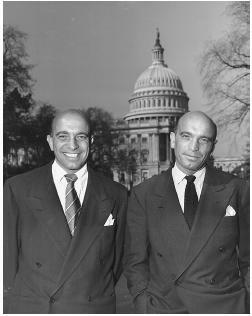 The identical twins, Julius and Philip, both graduated from Pennsylvania State University, after which Philip took up acting and Julius became a professional boxer. Julius's athletic career was shortlived, however, when he found work as a radio publicist, wrote a few oneact plays, and moved to California where he began his career in Hollywood as a ghostwriter. He quickly broke into more credible screenwriting when he sold an original story, Living on Velvet , to Warner Brothers in 1935. Sharing this first screen credit with another Warners writer, Jerry Wald (soon to become well known as a producer), Epstein signed a seven-year contract with the studio. Julius collaborated with Wald on a series of pictures, and worked on a routine Kay Francis vehicle, Confession , before he got his big break writing with the veteran screenwriter Lenore Coffee on Four Daughters . The team was honored with the first of Epstein's four Academy Award nominations. While Julius was making inroads at Warners, Philip made his way to California. After collaborating with Julius on a play ( And the Stars Remain ), Philip worked with various writers on routine pictures, mostly comedies, for RKO, Paramount, and Columbia. In 1938, following the popularity of Four Daughters , he joined Julius at Warners and they became an indivisible writing team until Philip's death from cancer in 1952. Their first joint assignment to duplicate the success of Four Daughters represents typical studio logic. The same cast, plus the same basic storyline, equals another hit. So the Epsteins repeated the film's blend of domestic conflict and romance in Daughters Courageous and in a sequel, Four Wives . These were followed by a decade-long, series of successes, many of which were adaptations of Broadway plays. The studio capitalized on the writers' talents at sophisticated, often rapier-like, dialogue, depending on the pair to adapt the material faithfully when it was good and to improve on it when it wasn't. Beginning with a remake of Maxwell Anderson's Saturday's Children , the brothers became increasingly skilled at pace and comic timing. Whether delivered by Jimmy Stewart and Rosalind Russell ( No Time for Comedy ), Monty Wooley ( The Man Who Came to Dinner ), Henry Fonda ( The Male Animal ), or Cary Grant ( Arsenic and Old Lace ), the Epsteins' dialogue was bright, pointed, and modern. Even a nostalgic period piece like Strawberry Blonde was enlivened by James Cagney's smart remarks and the quick tongue of Olivia de Havilland's forward-thinking suffragette. With their names appearing on only one conspicuous failure, One More Tomorrow (based on Philip Barry's Animal Kingdom ), the Epsteins proved themselves virtually guaranteed box-office. Their resultant power enabled them to work at home (a rarity at Warner Bros.), not obligated to "punch in" on the studio time clock. Ironically, their biggest success, Casablanca , was the adaptation of a theatrical failure, Everybody Comes to Rick's . Working with Howard Koch, the Epsteins turned it into an Academy Award-winning screenplay. In spite of the film's classic stature, however, Julius Epstein still insists that it is the worst kind of Hollywood "junk." In 1944, the Epstein's attempted their first film in the capacity of both writers and producers with Mr. Skeffington . Although the picture was a box-office success and won both Bette Davis and Claude Rains Oscar nominations, production problems made the film an unpleasant experience. They also tried writing for the stage ( Chicken Every Sunday and That's the Ticket ) and briefly joined Frank Capra on Why We Fight , a government-made documentary series. None of these ventures proved satisfying, so, they returned to screenwriting. After leaving Warners in 1948, the Epsteins wrote five more screenplays together, two of which, The Last Time I Saw Paris and The Brothers Karamazov , were released after Philip's death. Julius continued to freelance throughout the 1950s, 1960s, and less frequently during the 1970s; his most successful scripts were still comedies. He preferred working alone to collaboration, and on several occasions, Take a Giant Step , Any Wednesday , and Pete 'n' Tillie , acted as producer/writer. In 1969, he attempted playwriting again with But Seriously —and in 1978 adapted Harold Robbins's The Pirate for television. Today, Julius Epstein describes himself as a cynic, despite the number of romantic films he and his brother wrote over the years. The tone of those pictures, he insists, was shaped by the times, the tastes of the audiences, the demands of the studio, and Hollywood's prevailing censorship. He prefers honesty to sentiment and values adult entertainment over youth-oriented exploitation films. He names Reuben, Reuben as the type of film he would have rather written all along.